From the Wisconsin state capitol to Egypt´s Tahrir Square and all throughout America´s labor movement, young workers are making a difference. 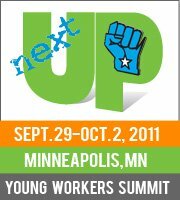 Join hundreds of young organizers, student activists and leaders who will come together in Minneapolis Sept. 29-Oct. 2 for the second annual AFL-CIO Next Up Young Workers Summit. This year´s summit will focus on educating, empowering, and mobilizing young workers for a just 21st Century Economy. Participants will have the option to choose between 30 different trainings and plenaries ranging from state battles to the attacks on voting rights, all while developing the tools to build strong coalitions between community and youth groups across the country. Register online before September 1 at http://www.aflcio.org/nextup to benefit from the reduced registration price of just $25. Let´s take this opportunity to come together as young workers and organizers to build the kind of future we want.